Be prepared when the undead come knocking at your door! It has the same functionality as their "normal" cans, but these have different colors and a fancy sticker. It is water tight, so I imagine blood would stay out too. Braaaiiinnnsss! In preparation for the inevitable Zombie apocalypse, MTM has created this Limited Edition Zombie Ammo Can which is perfect for storing your Hornady Zombie Max ammunition. Constructed out of rugged, reinforced polypropylene and featuring dual latches and the classic O-ring seal, this Ammo Can will withstand the harshest environments. Don't take a chance with Zombies raiding your Zombie Max ammo stash. 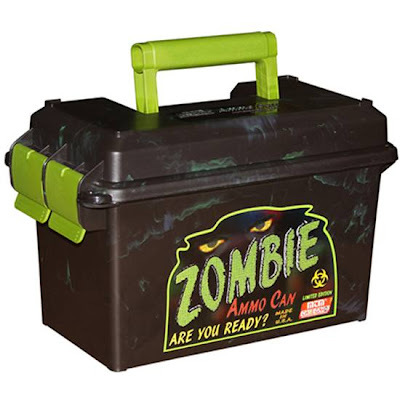 This American-made Ammo Can is Zombie Resistant! Are you ready? Get yours here. Now with more undead ammo storage!